Jeffrey A. 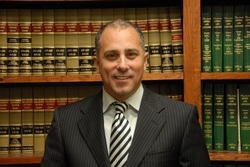 De Lisi has been practicing with the firm since 2003. His principal practice areas include civil litigation, zoning, administrative law, probate and estate administration, general commercial litigation and land use matters. He has particular experience representing developers defending zoning, subdivision and conservation appeals to Superior Court and state administrative agencies such as the Massachusetts Department of Environmental Protection. Mr. De Lisi also represents buyers and sellers in commercial and residential real estate development and purchase and sales agreements. Mr. De Lisi has appeared before state trial and appellate courts and various state administrative agencies and tribunals and before local city and town administrative boards and commissions. Prior to joining Ohrenberger, De Lisi & Harris, LLP, Mr. De Lisi was associated with Riemer & Braunstein, LLP in the loan workout and creditors rights practice areas. Material contained on odhlegal.com is intended for informational purposes only and is not intended as professional advice and should not be construed as such. Some links on this website may lead to other websites. Ohrenberger, De Lisi & Harris, LLP does not necessarily endorse or otherwise approve of the materials appearing on such websites.